Adirondack Blue is a hybrid potato variety with blue flesh and skin with a slight purple tint, released by Cornell University potato breeders Robert Plaisted,Ken Paddock and Walter De Jong in 2003. The Adirondack varieties are unusual because both the skin and the flesh are colored and have high levels of anthocyanins. This variety is good for boiling, baking, and mashing and can be used for brightly colored salads. Unlike many blue potatoes, it does not turn grey after boiling. Adirondack Blue has large and spreading foliage. The stems and leaves are green with a bluish tint. The flowers are white. Tuber set is moderate and the tubers are round to oblong in shape, slightly flattened, with intermediate to shallow eyes. The skin and flesh are purple and the skin may be slightly netted. Tuber dormancy is short. The tubers can be used for chips, but cannot be chipped from cold storage. Unlike most potato varieties developed at Cornell over the past few decades, it is susceptible to golden nematode. It is also susceptible to common scab, silver scurf, late blight, pink rot, leafhoppers, common potato viruses, Colorado potato beetle, Fusarium, and seed piece decay. Penn State's alumni association is marketing potato chips in the school colors using the Adirondack Blue. Because of their color, adirondack blue add a unique flair to everyday cuisine. In their native land of South America, they are often used in conjunction with herbs and spices to make salads and potato cakes, or they get sliced up, dried and eaten as they are. From a nutritional standpoint, these blue-pigmented heirlooms have multiple bells and whistles. Purple/ blue Potatoes are great for roasting, boiling, mashing and pretty much anything else you want to make with them due to their intermediate texture. In a similar fashion to the white type, they can be used for all kinds of recipes. They are especially useful when looking to create aesthetically pleasing dishes, which are hard to make with the white ones. Cholesterol is produced naturally in the liver and used for hormone production and cell formation. Foods with a high amount of cholesterol will raise blood cholesterol levels, which increases the risk for heart disease. Blue potatoes have 0 grams of cholesterol. However, if you were to add butter to your potatoes, the cholesterol and fat content would increase. One tablespoon of butter contributes 31 milligrams of cholesterol and over 11 grams of fat. Blue potatoes have a small amount of iron, which is necessary for oxygen transportation through the system. A serving of five small potatoes contains 6 percent of the recommended daily intake of iron. Both meat and fish have high iron content. Eating blue potatoes alongside them will make your meal higher in iron. 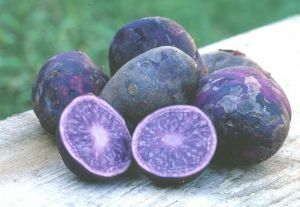 Blue-colored fruits and vegetables, such as blue potatoes, have a particular substance known as anthocyanins. These powerful antioxidants soak up renegade cells called free radicals, which reduces the risk of cardiovascular disease, stroke and cancer. Preparing the potatoes with any other bright-colored vegetable will boost the antioxidant power of the meal even more. Broccoli, cauliflower and cabbage for example, contain substances known as indoles, which have the same affect as anthocyanins.